The twenty-second volume of Vampire Hunter D has recently been released in English as a paperback by Dark Horse. You can purchase the volume from online retailers such as Amazon, Barnes and Noble, and Book Depository. It doesn’t appear to have an ebook format available at the moment, similar to the previous two volumes. Commissioned by a vampire ancient to recover the coffin containing the body of the demonic Gilzen, hated even by his own kind, D travels to a frightening mountain landscape perennially shrouded in snow. Within a castle piercing the mountainside, D discovers a group of knights tasked to protect Gilzen at any cost. It’s time for D to use all the forces and powers at his command to prevent Gilzen’s resurrection! This volume of the long-running series combines two novels and features eleven original illustrations by Final Fantasy designer Yoshitaka Amano. 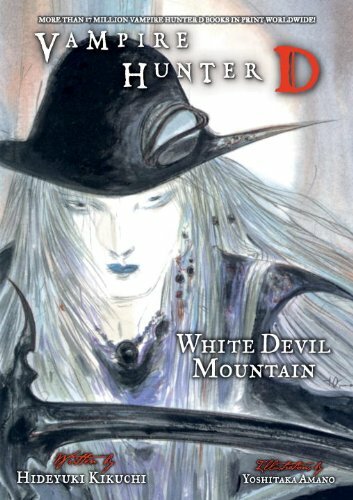 The first English volume of Vampire Hunter D was released in May 2005. You can find more info on the series here on this website.